Every mom can attest that taking their child’s temperature can be somewhat of a production. We have two thermometers is our house; one I use under the arm and one that I use as a rectal thermometer. Both came as part of a gift set when my first son arrived and both take more than a minute to read the final temperature. As you can imagine temperature taking at our house isn’t fun. 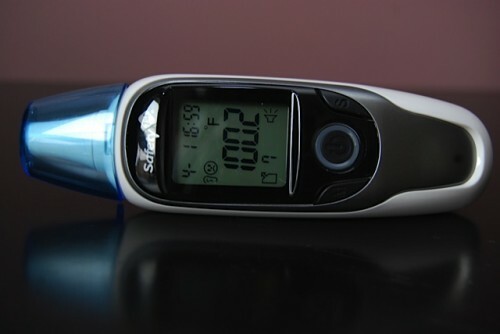 I was recently introduced to Safety 1st’s VersaScan Talking Thermometer($39.99) and it has proved to be valuable through flu season this Winter. Plus, this thermometer can be used to measure the ‘hotness’ of food or liquids, so we have also used it before baths, and hot chocolate. This digital thermometer has some really great features including a thirty measurement memory and an on-screen indicator to let you know if you should be concerned or not. Out of the box, the VersaScan Talking Thermometer came with batteries and was ready to go in just seconds. The literature inside the box should be saved because it has some important information on how to use the device and how to troubleshoot it if you think it’s not working properly. Safety 1st also includes a temperature chart that shows the normal range and fever range, which is good data to have on hand – especially for caregivers. Fever or ‘too hot’ temps are also listed on the back for quick reference as well. On the front of the device, there are 3 buttons – M (memory) to scroll through past temperatures, S(speaker) to turn the speaker on/off and power button. The set-up is easy. Users are given the option to set language (Spanish/English), speaker volume and date/time. 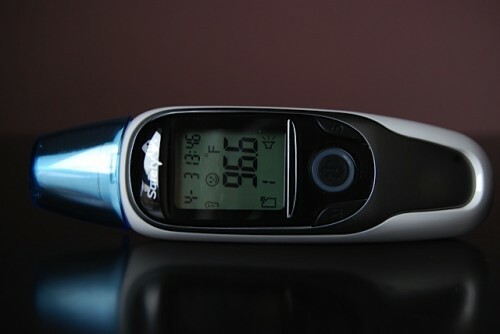 Once programmed all you need to do to take your child’s temperature is turn the thermometer on and the place the probe tip in the ear canal. The screen will light up, will beep and then show and say the temperature if you have that set. Quick, easy and non-threatening for little ones who are not used to being probed. Over the last 6 years, I could have used this thermometer a million times and am glad that we have one now. 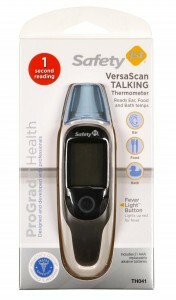 The Safety 1st VersaScan Talking Thermometer would definitely make a great shower gift idea. I highly recommend it! Hilary Duff Introduces Us To Luca!